to show when the keying hierarchy differs from the taxonomic hierarchy. In most cases, these diagrams show the originating couplet number in a key, but no other details of the key (couplet numbers were introduced in the section on Couplets, Targets and Rows). As will be seen in the Node Structure and Types section, connections for this type are implemented using a targetList in the nodeEntry. Species acriformis is not a target in any key; instead, it's subspecies are targets in the key to species. The following is a part of the FNA Ranunculus key that has one Characters Set for R. hispidus var. nitidus originating from the key to species and another from the key to subspecies. Every once in a while, research shows that a taxon should be moved from one place in the taxonomic hierarchy to another; for example, a species is moved from one genus to another. Howerver, the keying structure may work better if that taxon is keyed out from where it originally was. In an example from Flora of the Pacific Northwest, Sarcobatus vermiculatus is the new name for a species that used to be keyed from the Amaranthaceae key; it still does even though it is now in the Sarcobataceae family, so keying does not follow the taxonomic hierarchy. Note that Sarcobatus is a singleton genus and vermiculatus is a singleton species, so the only target needed is Sarcobatus vermiculatus. In the FPNW keys, Grayia is a singleton genus and spinosa is a singleton species within Grayia. Grayia is not a target in any key, but is needed in the diagram to show where spinosa fits in the taxonomic hierarchy. The target spinosa has 2 characters sets. One is in the Amaranthaceae key to genera, and the other is in the Atriplex key to species. The FPNW keys were updated to reflect that six genera are no longer in the Liliaceae family. To make the transition easier for users of the keys, those genera can still be keyed from Liliaceae, as well as from their new families Asparagaceae and Amaryllidaceae. As shown in the following diagram, targets for each of the six genera have two characters sets, the first in the new family's key to genera and the second in the Liliaceae key to genera. In Amaryllidaceae, Galanthus is not a target in the key, but is needed in the diagram because its singleton species nivalis is a target in the key to genera. From FPNW, this example shows a case where the target (Hydocotyle) has Characters Sets originated both in Araliaceae and Apiaceae, and is a target both in the Apiaceae fruit-based and vegetative-based keys to genera. The first step in using the FNA keys to determine the family of the specimen. The location of where that specimen was collected limits the possible families; this type of key localization is easily understood. The key to taxa in a family can also be localized. Since some of the paths through the key will lead to taxa not in a given location, there must choices for some couplets that also do not lead to the location. By tracing every possible path through the key for each taxa in the family (see Characters Sets and Paths), each couplet choice can be associated with a list of locations for taxa following that lead. 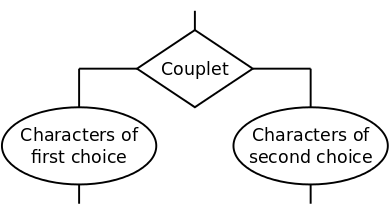 Therefore, for a given location, the only allowed paths are those that either those through couplets with your location for either choice or through couplets with just your location for one of the choices; that is, if your location is not on the list of locations for a couplet choice, the only possible path is through the other choice. The Alismataceae key is moderate sized, and the taxa in the family are widely, though not evenly, dispersed in North America. 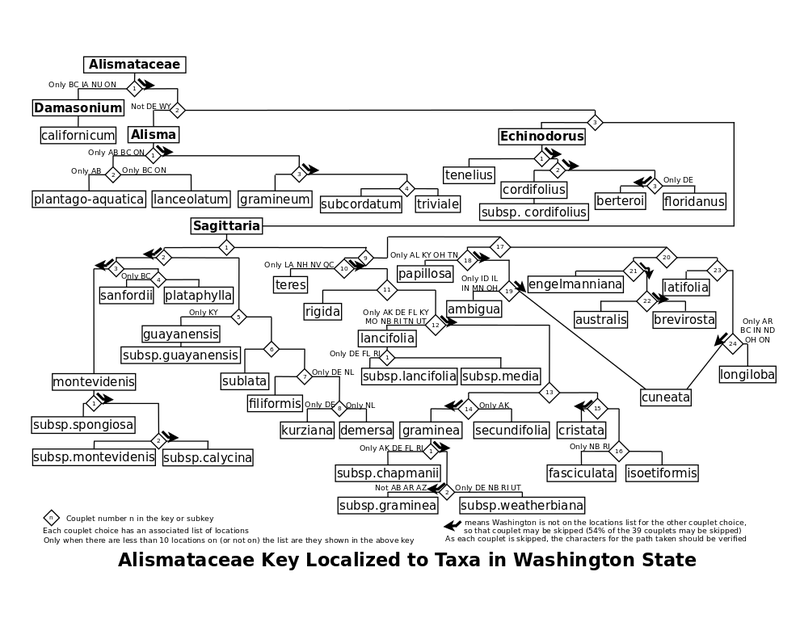 The following diagram for the key shows how it would be localized for taxa in Washington state. The couplet characters are not shown, but the couplet numbers are the same as those for the online key and for its subkeys. It is generally not worthwhile to use locations lists with printed keys because lists are usually too long to print and too long for the user to look through the list. But they could be used with online keys and with keying apps for smartphones and tablets; the user would specify the location (or locations), and they would be presented with a localized key. As the user traverses the key, they would be told when their path passes a couplet that could be skipped, and the user would usually verify that their specimen has the characters of the choice in the path taken. For example, in the above example, before getting to couplet 2 (the first couplet where they need to make a choice), they would be asked whether their specimen has the characters in the 1+ couplet choice. Creating good localized keys depends on accurate species location information. The webpage describing the regional keys for the Jepson eflora notes that, because of this, the key for larger area may need to be used to key out some species. Predetermined Characters - Just like being able to localize a key, a key can be pre-processed for a given morphological character that is used to differentiate targets in the key; the only allowed paths are those that result in targets that have that desired character, simplifying key traversal. For this method to be successful, work would be needed to parse the couplet leads, which can have ambiguous syntax, so it is not clear that use of predetermined characters would be cost effective. However, it may offer an alternative to creating interactive multi-access keys while offering the major advantage of multi-access keys: most characters of a sample do not need to be examined in a predetermined order. In the last section, we showed some diverse taxa that have multiple characters sets terminating on a taxon. That is, there is more than one path to the target taxon. In some of the more complex keys, there may be more than one path to a group of taxa. There are two cases where this occurs. If a key has subkeys there tend to be lots of them (see table in Key Types and Subkeys), so to keep them straight, the target name has an additional component ("key54" in this case) that numbers the subkeys in the key. The intermediate rank sect. Ovates having multiple characters sets leading to it is similar to multiple characters sets leading to the next rank (for example, Silene scolari shown in A Key as a Hierarchy). Both couplet 56 and couplet 57 have two characters sets leading to them. That is, there are two paths leading to the taxon group of Carex opaca and C. shinnersii, and there are two paths leading to the taxon group of C. opaca, C. shinnersii and C. missourieusis. In the FNA online key, special notation indicates couplets 56 and 57 are exceptional; in particular, instead of the standard (57) to indicate the next couplet is 57, the phrase "Go to couplet 57" is used for one of the characters sets. How a connector node is used with a target taxon that has multiple characters sets is described in Node Structure and Types. A connector node is also needed for a couplet with multiple characters sets leading to taxa group. The fact that couplets 56 is associated with the opaca_shinnersii_missouriensis taxon group (and couplet 57 is associated with the opaca_shinnersii taxon group) is stored as a group name in the couplet node. This is similar to storing the associated intermediate rank with the couplet node. However, they share generalized group elements. In particular, the End Nodes for both have the same dual role that is described in Node Structure and Types. To Do: Need a diagram like on 1/11/2015 in order to include the 2 types of connector nodes and to allow for 2 layers of connector nodes - use the real diagram for Salicaceae Populus on 12/30/2015. Need a diagram like on 1/28/2015 to show the all-inclusive sequence of nodes. Also need to show that multiple-attribute-set connector nodes can be both external and internal to the key. The Base Node provides the parent taxon name or intermediate rank name; all targets in the group are members of this taxon or intermediate rank. If the Couplet Nodes immediately follow the Base Node, it provides the base node number for the group; this node number is used to convert the row numbers of the Couplet Nodes to the node numbers used in the database. This is the case if the Base Node is a root, connector or singleton node. If the Couplet Nodes are separate from the Base Node, then the base node number is one less than the first couplet node number. This is the case if the Base Node is a target node (or a couplet node with an intermediate title) in a higher level node, so that node has dual roles: it is a target node in the higher level node group and Base Node for the current node group. If the Base Node is a singleton parent, then there are no Couplet Nodes and the singleton node is the single End Node and immediately follows the Base Node. In this case the Base Node can be a root, connector, target with an intermediate title or a singleton node. Note that if the Base Node is a singleton node, it also acts as a singleton parent. Singleton groups have no couplet nodes. Key groups have zero or more couplet nodes. With no couplet nodes, there are two target nodes. With one or more couplet nodes, the end nodes can be target or attribute set nodes. There are special cases where a target node can be replaced by a segregate node. If the end nodes are attribute set nodes, then associated connector node may specify a couplet node that acts as a merge point; that is, all attributes between the Base Node and the merge point are used in common with with all attribute sets associated with that connector node. If there are subkeys, the master key and the subkeys are separate node groups. They are joined together by couplet or connector nodes with an intermediate titles. As discussed under Base Node, the End Node could be a singleton node; in all other cases, there is always more than one End Node. For target End Nodes, the target node also acts as a Base Node for the node at the next level. Attribute set nodes exist when a taxon has more than one attribute set that describe that taxon, so require an associated connector node for the taxon, which acts as the Base Node for the node at the next level. In each of the three End-Node cases above, instead of the End Node being the Base Node for the next level, the End Node can be a terminal taxon. Target -- If the target is a key at the next level and does not involve a connector node, then that target node is connected directly to the key; as an example, in A Key as a Hierarchy see the diagram showing how the Caryophyllaceae key to genera is connected to the Silene key to species. Therefore, to create the Node List, one starts with the root for each family and works through each level, adding keys, connector nodes, alternate key nodes and singletons, where for each key a node is added for each row. The Node List is numbered using the class list index (cli) with values 0, 1, 2, ... (see diagram in Node Structure and Types). This process creates nodes in the order of the keying hierarchy rather than the Naming Hierarchy. Therefore, as nodes are created that have a naming-only parent, these parent nodes have to be added on the side and linked in using the Target Subset Index, discussed in Node Structure and Types. Additional Nodes for Alternate Keys - Six alternate keys were enumerated in Key Types and Subkeys. There must be a separate key base node for each alternative since each has separate child nodes. Also there must be separate target, attribute set and connector nodes for each alternative key since the parent(s) of each of of these nodes is different. Finally, each target or connector node needs an alternate-key connector node, in order to distinguish the different attribute sets from the paths through each alternate key. The node list and node numbering must take these additional nodes into account. After the user chooses which alternate key they want, this determines which of alternate nodes are to be used. The last three items in a node (the NodeEntry in the nodeList) are pointers to lists that contain a subset of other nodes. The parentList allows tracing each path back to the root node for a family. The childList allows tracing each path through each couplet in the key to all targets in the key; see A Key as a Hierarchy. The targetList also allow tracing each path to all nodes, but not through couplets; it also allows tracing to nodes for the rare cases where the nodes are only used for naming (see Naming Hierarchy) or nodes are not in any key, but are on the taxa list for a parent taxon. Node Types - The node type is specified in the tagListType field of each ClassEntry. The node type descriptions below need to be read in conjunction with understanding how nodes are related, which is described in Node Groups & Relationships and in the Dual Role of Nodes section below. Root - This is the base for each family, which contains the family name. Most are base nodes for each family key, but a few families have only one species, so no key is involved and the root is a singleton parent. Besides the family name, the node contains the unique taxon id assigned by FNA; also the FNA numbers each family (currently from 1 to 128), so this number is also contained in the root node (as the Target # in the table below). Each family root node is level 1 in the taxon hierarchy. If a root node is the base node for a family key, the children are row 1 and 2 in that key, so the node has the dual role of being the first couplet in the key. This is not the case if there are alternate keys for the family; instead the root node has the base node for each of these alternate keys as its children, and it has the dual role of offering a choice of the names of the alternate keys to the user. 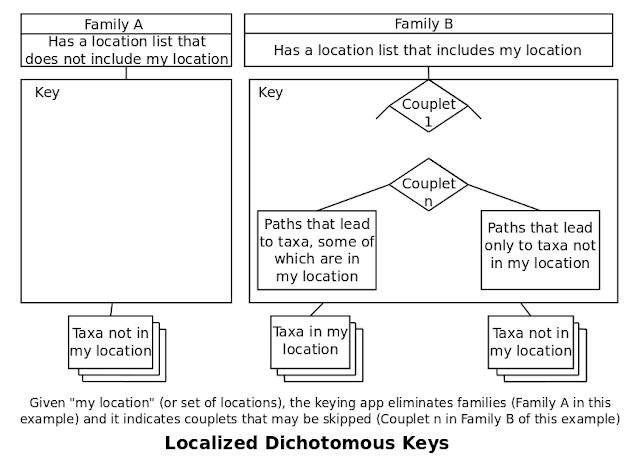 Couplet - Couplet nodes document the decision points in the keys (see A Key as a Hierarchy). The node has pointers to each of the two choices of attributes, but those attributes themselves are not contained in this node. However, in this node is the attribute(s) for the choice that led to this couplet. For each couplet choice an attribute shows what locations (see Taxon Locations) taxa with paths through this choice are found; this also applies to terminal taxa. The level of this node is the same as that of the base node for this key. As mentioned in Key Types and Subkeys, some keys have subkeys, each of which is given a name with a number or letter or with an intermediate taxon rank; for subkey couplet nodes, this name is stored with the couplet node (other types of couplet nodes do not have a name). An intermediate rank can also be associated with a choice that points to another couplet rather than to a subkey. Besides pointing to another couplet node, a couplet node can point to two types of target nodes, which are described next. Attribute Set - This node corresponds to one attribute set for a destination taxon that has multiple attribute sets (an attribute set is a sequence through the key leading to a target taxon; multiple-attribute-set targets were described in A Key as a Hierarchy). This node is similar to a target node, but since there are multiple paths to this destination taxon, there is also a special connector node that each of these attribute set nodes point to. Appended to the taxon name is an attribute set number in order to make the node name unique. There is no relative target number and taxon id since these are in the connector node. Note that there can also be multiple attribute sets leading to subkeys, so in this case instead of a taxon name, the name is an intermediate taxon name. Alternate-Key Connector - This node is needed whenever there are alternate keys (in addition to the alternate key node, which is discussed next). In this case, a connector node is needed for each target in the alternate keys, so that as couplet choices are made that traverse down through any target, which of the alternate keys was used can be saved and when traversing back up through that target, the same alternate key is used in creating the attribute list for the terminal target. If there are multiple-attribute-set nodes in an alternate key, a multiple-attribute-set connector node is needed for each set, and each of those connector nodes is connected by an alternate-key connector node. Alternate Key - An alternate key node connects a root or target node to all available alternate keys for the family or target. Currently only eleven alternate key nodes are needed, which are listed in Key Types and Subkeys. Each alternate key node is the base nodes for the corresponding key. Each is named so that the parent can offer a choice to the user which of the alternate keys they want to use. Singleton - This node represents a singleton node, which results when a parent node only has one child that is at the next level, so no key is involved. 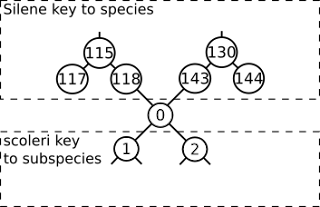 A root node, a target node or a connector node can be a singleton parent node. A singleton node contains the taxon name, relative target number and taxon id. Missing-Key Target - If a taxon has children, but the key to distinguish the children from each other is missing, then they can still be listed under that taxon. For those that are not terminal, then lower keys may exist, so that a hierarchy can be shown with a gap for the missing key. A missing-key target is also used when a taxon is keyed at a level that is not normal for that taxon; e.g., there is no need for a subsp. key for Piperia elegans because all these subspecies are in the key for species at the Piperia level, but a missing-key target node is needed for Piperia elegans to show the hierarchy of names from Piperia to elegans and then to its two subspecies (see Naming Hierarchy) [so a better name for this node type may be "Target Not-In-A-Key"]. Segregate - A target in a key that is where a taxon used to exist before FNA moved it to a new location in the hierarchy. A link gives that new location, so that keying of a specimen can be resumed from there. See Node Groups & Relationships for a description of how nodes are combined to model the FNA keys. These are not separate nodes, but nodes at the previous level acting in their other role. In A Key as a Hierarchy, an example shows a row in a key can have dual roles in that key and the key at the next higher level. In Node Groups & Relationships the more general term Base Node is used for Singleton Parent or Key Base. Create a new Tag object. Add that object to the tags array list, keeping track of the tag index. Create a new TagList object, using the tag index. keeping track of the tag list index. Get a reference to that TagList object. For each addition tag needed, create a new Tag object. Add that tag index to the TagList object. Insert the tag list index obtained in step 3. in the class entry. 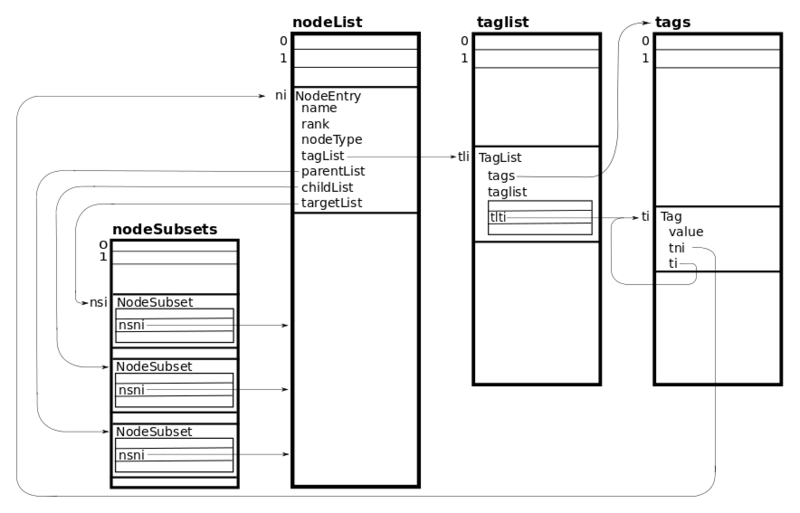 This section shows conceptually the structure of the FNA keys; the structure of the database used to store those keys is explained later in Node Types & Relationships. In particular, how all the keys at the different ranks fit together to create one key for the whole family. As mentioned in Couplets, Targets and Rows, each couplet choice leads to either another couplet or to a target. If all targets in a key have a single parent, then there is a unique path between the root of the key (a family, genus, species or subspecies) to each target, usually one rank down from the root. That is, from each target one can unambiguously traverse back up to the root of the hierarchy. That is, depending on which parent is chosen, a different path and characters set results. Connection of a Key to a Key at the Next Higher Rank - How keys are connected to the key at the next rank is different for targets with single and multiple parents. An example of each case is shown below. 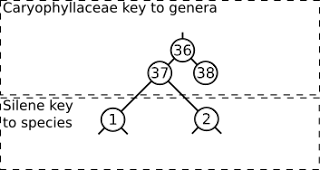 The row numbers in this diagram are relative to the key for the rank; in the Key Types and Subkeys section, renumbering of rows in concatenated keys is discussed, but row numbers in the above diagram are before that renumbering. Comparing the Silene key to the Drymaria key using row numbers in the Couplets, Targets and Rows section, row 37 is the root of the Silene key, which is called row 0 in the Drymeria key. What is important is that the parent for the initial couplet in the Seline key is in the Caryophyllaceae key, so the logic to set up this parent-child relationship is different than if they were in the same key. Row 37 is the Silene target, but it also has a next couplet that is the first couplet in the Silene key. See more on the dual role of nodes in the Node Structure and Types section. The Node Structure and Types section discusses how key structures, including these special multiple-characters-set targets, are represented as data structures. In particular, a childList is used for the choices of a couplet and a parentList is used for the parent, or, if there are multiple-characters-sets, for the parents. Because the alternate keys add new attributes and new paths through the keys, each key must be handled separately (see Node Structure and Types for the mechanism to choose which alternate key to use and see Node Groups and Relationships for the effect on node numbering). Adding the six alternate keys, there are 2151 master keys. Of these, 51 have subkeys, so 2100 don't. Those keyed taxa with subkeys tend to have a lot of subkeys: 427. My list of taxa with multiple keys, with their alternate keys, master key and subkeys, is here. You can see from this list that the names of the subkeys are either an intermediate rank that has its own subkey or a number or letter. Some taxon pages have a List of Keys, which contains the master key and subkeys. More commonly, keys for intermediate ranks are included in the list of lower taxa. Some of the intermediate ranks listed by this method are singleton parents (they have only one child), so these are not subkeys. Concatenated Keys - Numbering of couplets and rows in keys and subkeys start with 1; numbering of couplets and rows in keys was discussed in Couplets, Targets and Rows. But to create a single key for a key that has subkeys, the master key and all subkeys must be concatenated into one key. The numbering of couplets and rows in the first subkey must be renumbered to continue where numbering left off in the master key, and likewise as each subkey is added. As an example, look at the couplet and row numbers shown in the partial paths diagram for Brassicaceae Boechera shown in Couplets, Targets and Rows. This was created from the master key and from the Group 1 subkey; the couplets and rows for the subkey were renumbered to continue on from the numbering in master key. If keys followed a strict hierarchy, from family to genus. to species. and to subspecies, then numbering in keys could start with 1 for each family. But since that is not the case, keys must be concatenated and renumbered again, in order to form one key starting with 1. In the resulting key, targets no longer need to follow the traditional hierarchy. Printed keys do not need to used concatenated keys. I've posted two spreadsheets that show state or province postal codes for all FNA terminal taxa. Due to a Google Drive spreadsheet size limitation, these data were split: Alberta through North Dakota and Nebraska through Yukon Territory. Taxon counts by location are in the last row. Indirect location information is most commonly found from a distribution map. One of the taxa (Iris germanica) with no location information says it "may persist after cultivation"; the other (Corispermum nitidum) says it was "supposedly introduced but doubtful". Location information for the few taxon without their own page has not been added yet. The 65 North American locations used in the FNA are the 49 continental states and District of Columbia in the USA, the 13 provinces and territories of Canada, Greenland which is an autonomous country within Denmark, and the islands of St. Pierre and Miquelon which is a self-governing territory of France. In the future, if a user of the FNA keys selects the location(s) that they are interested in, then the keys can be customized. Then the keys would only show those couplets and terminal taxa relevant to their location(s), which greatly simplifies keying a specimen. Also the keys can be simplified because there are location-specific couplets in the keys; these couplets may eliminate all except one attribute set leading to the terminal taxa. Before using FNA keys to identify a specimen, the family must be known. If the family is not known, use, for example, the angiosperm and gymnosperm key to families, which are multi-access keys, created as part of the Pathkey project. In each FNA key, couplets are numbered starting with 1. A couplet gives a choice of two alternatives, each of which describe one or more characteristics (called "characters") that are to be matched with the specimen that is being identified. The first choice in the key is labeled with the couplet number and the second is labeled "+". Following each choice, where to go next in the key is indicated by a couplet number. However instead of a next couplet, one or both choices may lead to a destination target, which is a taxon with rank normally one lower than the rank of the key. As a choice is made at each couplet, the characters set (see Characters Sets and Paths) for the target grows. In other words, the row number of the second choice is double the couplet number, and the row number of the first choice is one less than this. This assumes that each couplet lead is only on one row; that is all lines for characters of a lead are put into one row. The algorithms for traversing the keys depend on this couplet-to-row relationship; see Key Types and Subkeys and Relation of Key Structure to Taxonomic Hierarchy for how special cases are handled to maintain this relationship. A row number 0 (representing the root of the Drymaria key) has been added as a starting point. When row numbers are needed, a third version that has both couplet and row numbers is easier to use. For an example of such a diagram, see the one in Characters Sets and Paths for Brassicaceae Boechera. Notice in that diagram when the row numbers are twice couplet numbers. Also note that the row number of the first choice in a couplet is put to the left of the couplet, and the second choice is put to the right. Couplet diagrams are easier to create and understand, but rows are used to help create the characters-set list for a target, as described in Characters Sets and Paths and are needed to understand how keys at different ranks are connected, as described in Key Structure. As discussed in Key Types and Subkeys, when keys for the multiple genera of a family are concatenated to form the key to species for the family, rows are renumbered, so that the row number applies to the key for the family. That is, for the family key, couplet numbers are less useful because they only apply to the key for a given rank, but row numbers can be used to uniquely identify any couplet or target in the key at any rank in the family. Also row numbers are used in constructing nodes, as discussed in Node Structure and Types. As one makes binary choices of characters in a key, one creates a set of characters for the destination target and a path through the key. In listing the Characters Set (CS), it is more useful to reverse the order, so those characters chosen last are listed first because those are are most specific to the target. However, the CS can be more complex. One reason is that there can be more than one CS for a target when there are diverse characters leading to it. In the FNA keys, targets whose name is appended with "(in part)" in the key have more than one CS. Keys in this papers instead append CSn to the target, where n=1,2,…; that is, there are multiple characters sets, which are numbered. Basal leaf blades 10-25(-50) mm wide; petals 3.5-6 mm. From this point on as you read this paper, make sure you can reproduce the diagrams given the source FNA keys. This will make sure you understand each concept as it is presented. The following diagram for the Brassicaceae Boechera key shows how these characters-set lists relate to the type of diagram discussed in Couplets, Targets and Rows. This diagram is easier to understand because it shows both couplet and row numbers and because it shows only the paths of interest through the key. 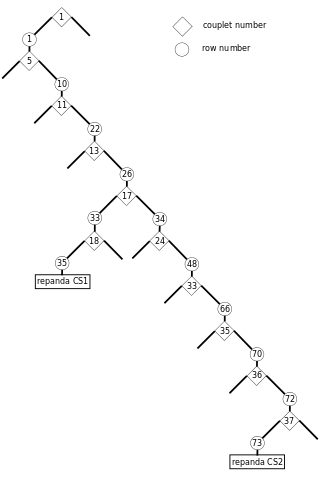 From this, the list of characters for B. repanda CS1 can be found in rows 35 and 33, those for CS2 are in rows 73, 72, 70, 66, 48 and 34, and those in common for both CSs are in rows 26, 22, 10 and 1. The paths for CS1 and CS2 merge at couplet 17; the choices for couplet 17 lead to either CS1 or CS2 of B. repanda. If there are multiple characters sets for a taxon, there will be one or more couplets that will be merge points where the taxon has the characters of both choices of the merge point couplet. There are two other reasons that the characters set for the path through a key can be more complex. As discussed in Key Types and Subkeys, some taxa have keys with subkeys (as does Boechera); each of these subkeys, which may correspond to intermediate-rank targets, add a characters set or multiple characters sets. Also, as shown in Multiple-Characters-Set Groups, a couplet can have multiple characters sets even if there is no subkey, although this is rare. Using the above methods, it is possible to list every characters set for a family and to follow every possible path through the key. For large families, with keys at each rank and possibly subkeys and alternate keys, that list can be long. However, as shown in Localized Keys and Predetermined Characteristics, following every path allows one to create localized keys from the FNA key.